ASHTABULA � A 2-year-old boy was killed in a basement fire Tuesday afternoon at home. Jorden Elliott, 2, of 3501 Hiawatha Ave., was playing in a toy room near the clothes dryer when the fire started and he became trapped, said his mother, Danette Elliott. The mother believes the dryer caused the fire. She tried to get to her child, but the intensity of the flames and the thick black smoke prevented her from doing so, she said. The Ashtabula Fire Department received the call at 3:30 p.m. and arrived on the scene three minutes later to find a well-developed fire in the basement and several reports of a child trapped inside, according to firefighter reports. Everyone else escaped without injury. 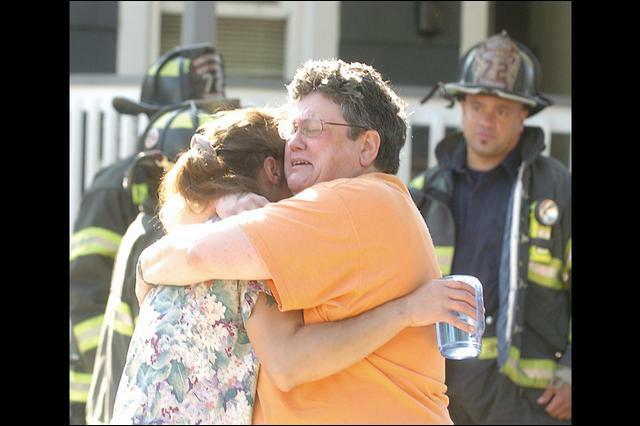 Neighbors came out of their homes and watched from their porches and front lawns as firefighters worked. Teresa Pierce and other women from the neighborhood stood outside the house next door, held hands and prayed for Jordan�s safety. A neighbor man held Jordan�s twin brother, Jared, tightly in his arms as Elliott nervously waited for news. Rescue workers gave Elliott�s grandmother, who also was on the scene, a cold compress for her head. The fire was under control in five minutes, but the child trapped inside died, firefighters said. When the news came of the child�s death, everyone took it very hard. Elliott, who was very distraught, was taken inside a nearby house for a short time. Pierce leaned against the minivan parked in her driveway and wept. Other people shook their heads. Neighbor William Abrams said it was a terrible tragedy. Abrams said Elliott, a single mother, works hard as a nurse to take care of seven children. Earlier in the day, Abrams helped her move some beds upstairs to make room for her grandmother to move in with them. �It�s just an awful thing to have happen,� Abrams said. A joint investigation by the Ashtabula Police Department, Ashtabula fire marshal, Ashtabula County Coroner�s Office and Ohio Fire Marshal�s Office is under way to determine the cause of the fire, Ashtabula Fire Chief Ron Pristera said. The house is owned by DJC Property Management of Ashtabula, according to the Ashtabula County Auditor�s Office Web site.